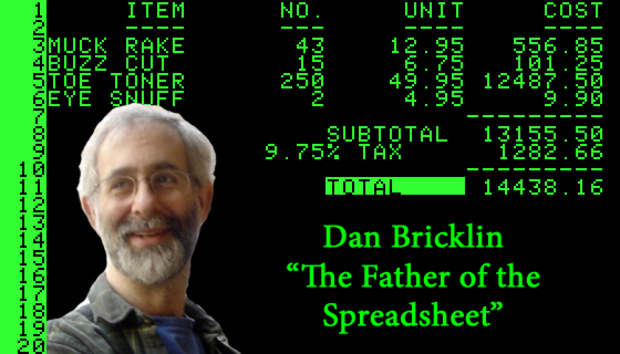 If you use spreadsheets — and today the number of users that do so must be in the hundreds of millions — then every time you open a new workbook, edit a cell or calculate a formula, you can thank Dan Bricklin’s legacy. Bricklin, an MIT graduate and Harvard MBA, developed VisiCalc with Bob Frankston back in 1979. The program not only gave rise to many of the elements of modern spreadsheet programs, selling over a million copies along the way, but, after its 1981 port, also helped the IBM Personal Computer become one of the most important new products of the 20th century. Recently I spoke to Bricklin by phone about VisiCalc, its legacy, the rise of the PC generation and what’s happened since. First, I asked him to sketch a picture of financial management as it was when he wrote the code for what would become VisiCalc. Although the spreadsheet made his name, Bricklin had been largely concentrating on another software category that was to change the way the world worked. When Bricklin prototyped VisiCalc, he showed it to his Harvard professor who told him that his competition was calculating on the back of an envelope; if VisiCalc wasn’t faster, people would never use it. That notion helped make Bricklin a pioneer in another way: delivering a user experience (even before the term had been coined) that was intuitive so a new computer user would understand the new electronic tools. So, VisiCalc looked like a ledger book. Similarly, in word processing, manual tools like scissors and glue became ‘cut’ and ‘paste’ features. Add in extra automation capabilities such as having words automatically wrap around lines of text and you had something that was revolutionary, in the days before even Wang and WordStar automated office tasks. But at the time, computers were rare, pricey and lacking a standard. That pioneer environment explains why Bricklin had no great expectations for commercial success with VisiCalc but he was driven by an idea. “I came from the word processing world and in this What-You-See-Is-What-You-Get world I’d seen a mouse and was familiar with interactive systems. I think it’d seen an Alto [early Xerox computer], played Space War [a game for the DEC PDP-1], seen Sketchpad, knew APL and Basic. The idea of having what we did with words and numbers on paper but with computation seemed pretty obvious; if there was a ‘eureka’ moment, that was it. With the benefit of hindsight though, grass shoots and signs were discernible. Also, the economics of the day were very different as an Apple II “fully loaded” with daisywheel printer and screen cost about $5,000, the equivalent of about $18,000 today. This was also a time of scepticism about personal computing with the leading IT suppliers considering it a fad for hobbyists rather than a big opportunity to sell to business users. This attitude was underlined when Bricklin says he considered putting VisiCalc on DEC’s PDP-11 microcomputer before deciding on the Apple II. That sort of attitude was unlikely to change Bricklin’s desire to set up his own company with Frankston rather than market his idea to the computing giants of the time. Although VisiCalc is sometimes presented as a smash hit that immediately launched the IBM PC, that notion is wrong on three points. VisiCalc was released on the Apple II in 1979, there were other ports before it was made available on the IBM PC, and the initial reaction from the wider world was lukewarm. But by comparison to other business software for the personal computer, VisiCalc was a success and the most clued-in sales people at resellers used it to show what personal computers could do. If the laurels are to Bricklin and Frankston for creating the modern spreadsheet from the confluence of the rise in microcomputers, business interest and new software development languages, it was another program and company that cashed in on the full flowering of those trends. “When Lotus 1-2-3 came out [in 1983], the moon and stars were aligned for [Lotus founder and Bricklin’s friend] Mitch Kapor [to be successful] just as they had been for me to create VisiCalc,” says Bricklin, who adds that he knew the better program when he saw it. Turn another corner and things could have been different though. Microsoft’s dominance of PC software could have been even greater had it been smarter with its Multiplan product, Bricklin believes. Had Bricklin been more aggressive and the laws of the day been different, he could have pursued Lotus through the courts for the many features that arguably were derived from VisiCalc. “The law in the US was that you couldn’t patent software and the chances were one in ten you could try to sneak it through and call it a system,” he recalls. In truth, Bricklin would make an unlikely litigant and says he never considered such a path. He is proud, rather, that his legacy still looms large, even if he didn’t make the millions that others did. The tech investor Ben Rosen called VisiCalc “the software tail that wags (and sells) the personal computer dog” and there’s no doubt that it played a big part in what happened later to our digitising universe. While some pioneers skulk and criticise others that followed them and were successful, Bricklin appears to have no trace of bitterness. He remains a staunch fan of Microsoft and Excel, a product that remains a cash machine and still bears the stamp of VisiCalc, 35 years on. “Doing VisiCalc, I had to come up with the essence of what you need in 32K of RAM and our notion of what was important was correct, it turned out,” he says. But the power and richness of Excel are remarkable, he says, rejecting the notion that the Redmond company is guilty of creating bloatware. “Microsoft came from engineers building things: programmers, programmers, programmers — and the hearts and minds of programmers mattered a lot to them. People want to customise things, make it right for what their problem is. It’s the difference between being a carpenter and being an architect — one size does not fit all. “Microsoft built systems that could be customised, so users could replace that part themselves and it listened to a lot of people and provided what they wanted, all the bells and whistles. People say you end up with bloatware and only 10% of the features get used by any user but that 10% is different for a lot of users. Apple went for smaller number of people and that’s OK because there’s Microsoft for the rest. [Microsoft] had business practices that people didn’t like but is that different than other companies in other industries? Not necessarily. If Bricklin was before his time with VisiCalc, he was also early onto new trends in user input, creating pen-operated applications at Slate Corporation in the early 1990s and in 2009, a Note Taker app for the “magical” iPad he so admires. That took him to the latest stage of his journey, as CTO for a company specialising in using HTML5 to make software multiplatform. Bricklin remains awestruck by changes he has seen in a lifetime of computing that has made him a sort of smarter Forrest Gump or Zelig for the binary age — a person who was around at some of the biggest the zeitgeist moments in computing history. Bricklin seems content to be recognised as a founding father of the segment, rather than a Rockerfeller. Bricklin delights in the fact that science fiction has become reality and that naysayers have been disproved. It gives him pleasure to think that that those who mocked the personal computer as a place to store recipes now Google their ingredients to automatically generate recipes. He ponders the rise of the PC and the changes it wrought as people were freed to create, compose, calculate and pay. « Q&A: Are Eye-Tracking Desktops Nearly Upon Us?